The St. Johns River Water Management District’s primary goal in purchasing and managing land is to protect water resources. While doing this, the district also actively manages the properties to protect native plants and animals. For more than 30 years, district staff have undertaken projects to protect wildlife on district lands. The following is an overview of some of those projects. 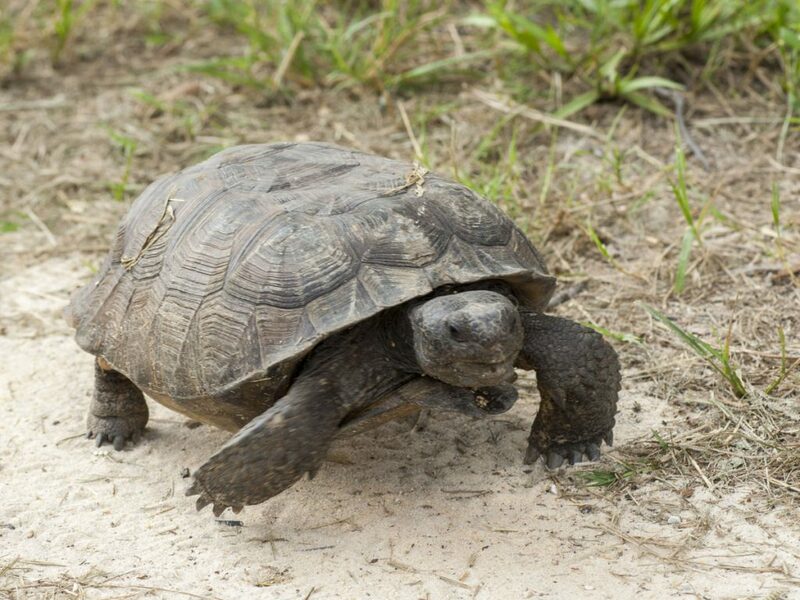 Gopher tortoises live in elaborate tunnels — known as burrows — dug deep in sandy soils. In 2014, gopher tortoises that had made their homes in the flood control levees in the Upper St. Johns River Basin (Orange, Indian River and Brevard counties) needed to be moved to ensure structural integrity of the levees. Prior to the relocation of several dozen tortoises, district staff located and mapped burrow entrances to determine the approximate number of tortoises living in the area. They also arranged to move the tortoises to a site approved by the Florida Fish and Wildlife Conservation Commission (FWC). Such sites can be public or private property with habitat suitable for tortoises. Each relocated tortoise was examined, documented and marked for future monitoring. In Florida, the species is listed as threatened. Gopher tortoise (Gopherus polyphemus) burrows average seven feet deep and 15 feet long but may be more than 40 feet long. A tortoise may have multiple burrows. Burrow openings are half-moon shaped with the curve at the top, and its size is a fair representation of the size of the tortoise. In addition to housing the tortoises, the burrows provide housing for as many as 350 other creatures, including frogs, snakes, mice and burrowing owls. Adult tortoises are generally 9–11 inches long and weigh 7–9 pounds (district staff have encountered tortoises up to 18 pounds). Tortoises can live up to 40 years. One clutch of tortoise eggs is laid per year with an average of six eggs. Many never hatch because they are eaten by mammals, birds and snakes. The biggest threat to the gopher tortoises’ long-term survival is loss of habitat. The snail kite is considered a barometer of the success of freshwater wetland restoration in central and south Florida. 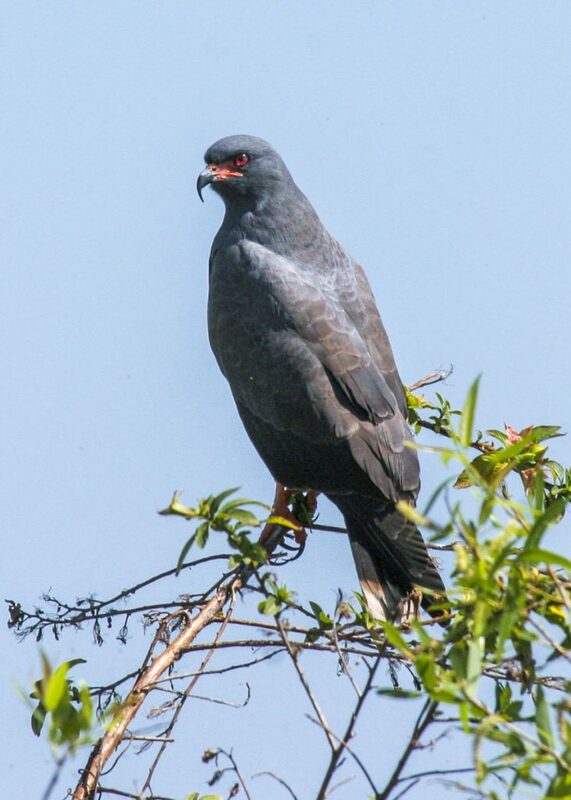 The snail kite needs an open clear-water habitat interspersed with patches of emergent vegetation. This habitat supports the kite’s visual hunting style (hunting by hovering over the water or viewing the water from a perch) and nesting needs. In the Upper St. Johns River Basin (Indian River and Brevard counties), the district manages the hydrology on thousands of acres of public land for flood protection and environmental conservation. By balancing water levels to meet these two needs, the district creates and maintains the habitat preferred by the snail kite and its primary food source, the apple snail. Snail kites (Rostrhamus sociabilis) were listed as endangered in 1967. The population is vulnerable to the stresses of habitat loss, prolonged droughts and anything that affects the availability of apple snails, its primary food. The snail kite is a medium-sized bird of prey. Males are dark gray; females and juveniles are brown with a streaked breast and light eyebrow and cheek patch. All snail kites have a white patch at the base of the tail, ending in a dark band with a narrow white edge. This raptor inhabits flooded freshwater areas and shallow lakes in peninsular Florida and Cuba. The bird’s historical range once covered more than 8.9 million acres (3.6 million hectare) in Florida, but is now restricted mostly to the Everglades, Lake Okeechobee, the Kissimmee Chain of Lakes, Loxahatchee Slough, the Kissimmee River, and the Upper St. Johns River. Snail kites breed from December to August, laying an average of three eggs. The birds build nests in a variety of wetland trees, shrubs and emergent vegetation. District staff have assisted the Florida Department of Transportation (FDOT) and FWC in projects where bridges have been built over major highways or underpasses constructed beneath roadways to provide safe passage for bears and other wildlife. The bridges and underpasses often connect public conservation areas and are constructed and landscaped to encourage bears to use them and avoid deadly encounters with vehicles on roadways. One such underpass is near Palatka (Putnam County) under State Road 20 between two sections of the district’s Rice Creek Conservation Area. 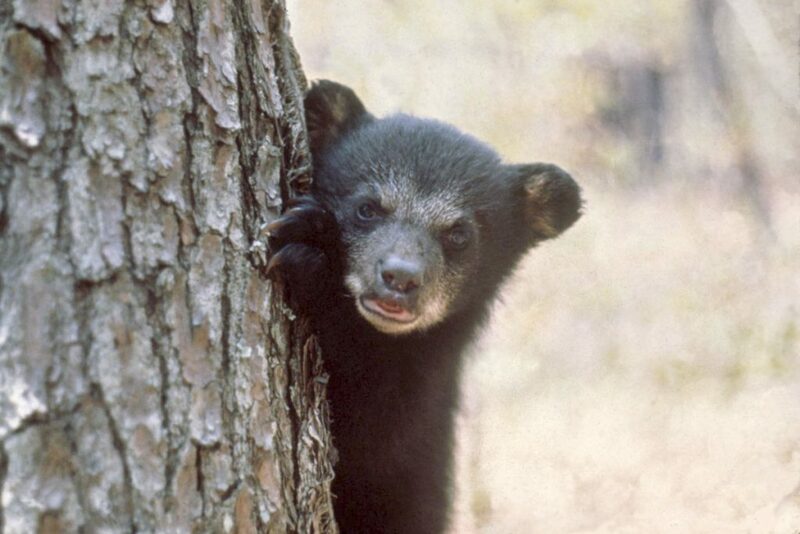 Black bears (Ursus americanus floridanus) are the only species of bear found in Florida. 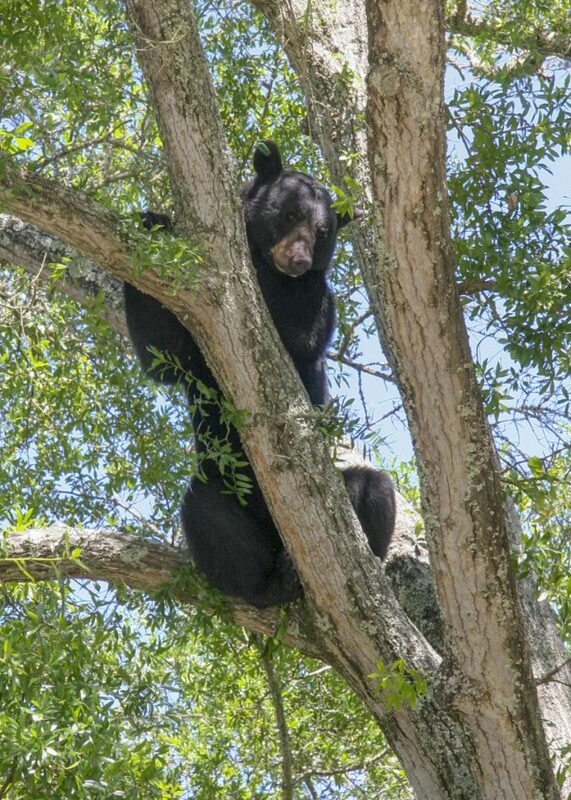 An estimated 2,500 and 3,000 black bears live in Florida. This bear is considered a conservation success story, as it was removed from the threatened species list in 2012, though rules remain making it illegal to injure or kill a bear or to possess or sell bear parts. Adult males weigh between 250 to 350 lbs. Adult females usually weigh between 130 and 180 lbs. Adult male bears generally live within a 60 square mile area; females live within a 15 square mile area. A black bear’s diet comes primarily from plants (fruits, nuts, berries), insects (termites, ants, yellow jackets) and about 5 percent from meat (opossums, armadillos, carrion). Since the early 2000s, the district has worked with the U.S. Fish and Wildlife Service to manage red-cockaded woodpecker habitat at Hal Scott Regional Preserve and Park in east Orange County. Birds from Apalachicola National Forest in Florida’s panhandle — where the birds are more abundant — have been relocated to Hal Scott Preserve and other suitable areas to help propagate the species. Prior to moving the birds, district staff build artificial cavities of hollowed-out wood, which are then inserted into holes in trees. After installation, small holes are poked in the tree above and below the cavity to allow the sap to flow, making it difficult for snakes and other predators to climb the tree — a natural defense system that biologists learned from the woodpeckers. Relocated birds are tagged with leg bands and released near the newly created tree cavities. The red-cockaded woodpecker (Picoides borealis) has been a federally protected endangered species since 1970 and is listed as endangered in Florida. Florida hosts approximately 25 percent of the nation’s red-cockaded woodpecker population, with an estimated 1,100 active family groups. Many of Florida’s populations are carefully managed on public lands, the largest of which are Apalachicola National Forest and Eglin Air Force Base. There are an estimated 55 to 85 active groups on private lands, with the largest concentrations in the south-central and southern portions of Florida. 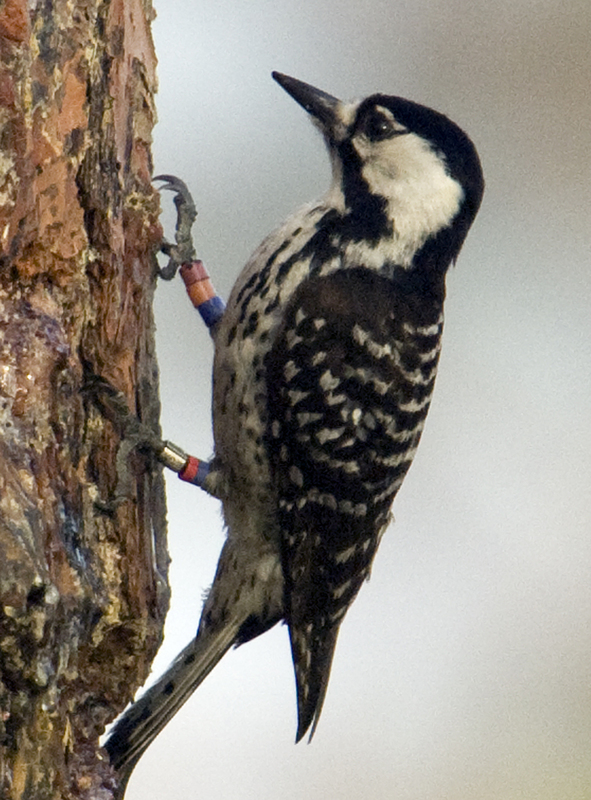 The red-cockaded woodpecker is the only one to make its home in live trees, primarily mature longleaf pines. Breeding pairs are monogamous and raise a single brood each year. Their diet consists of ants, beetles, caterpillars, corn ear worms, spiders, centipedes, wood-boring insects and seasonal wild fruit. District scientists place bands on the legs of the newly-hatched red-cockaded woodpeckers, an endangered species native to Florida. The district has participated in several Florida Scrub-jay relocation projects; the most recent in 2014. The cooperative project with the Brevard Zoo relocated two families of birds from a parcel of land under development in Brevard County to the district’s Buck Lake Conservation Area (Brevard and Volusia counties). Like previous bird moves, staff gained the trust of the birds over several weeks and were able to lure them into humane traps. Zoo staff conducted a health exam on each bird, then district staff attached identifying leg bands. After being acclimated to the conservation property in large cages over a few days, the birds were released and continue to be monitored. The Florida Scrub-jay (Aphelocoma coerulescens) is listed federally and in Florida as a threatened species. The bird reaches lengths of 12 inches, with a wingspan of 13.5 inches. 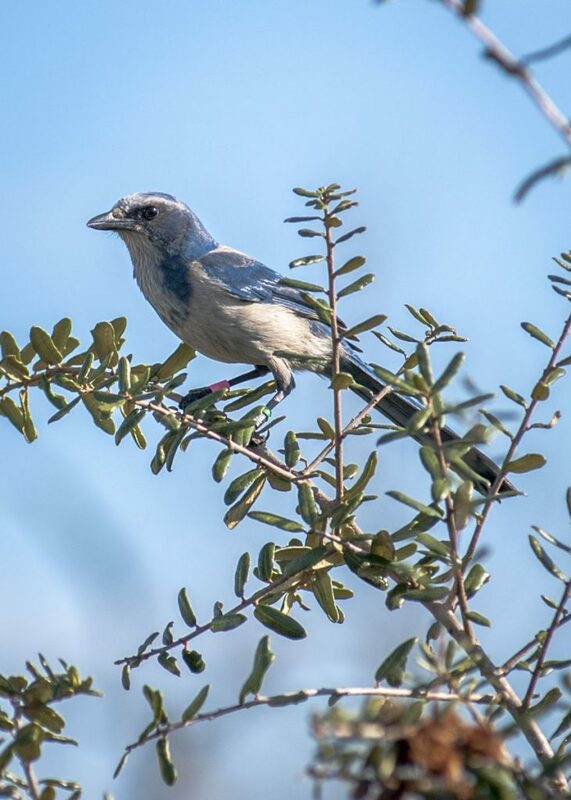 Florida Scrub-jay is restricted to scattered, often small and isolated patches of sand pine scrub, xeric oak scrub, and scrubby flatwoods in peninsular Florida. The birds prey on terrestrial invertebrates, and on small vertebrates including frogs, toads, lizards, snakes, birds’ eggs, mice and acorns. Nests are generally only 3 to 10 feet above the ground. The birds live in family groups composed of a breeding pair, their current and past offspring, and sometimes other “adopted” birds. At the Bayard Conservation Area (Clay County), just a handful of Bartram’s ixia existed two decades ago. The district has conducted prescribed fires on the property to manage undergrowth that could fuel hotter-burning wild fires. 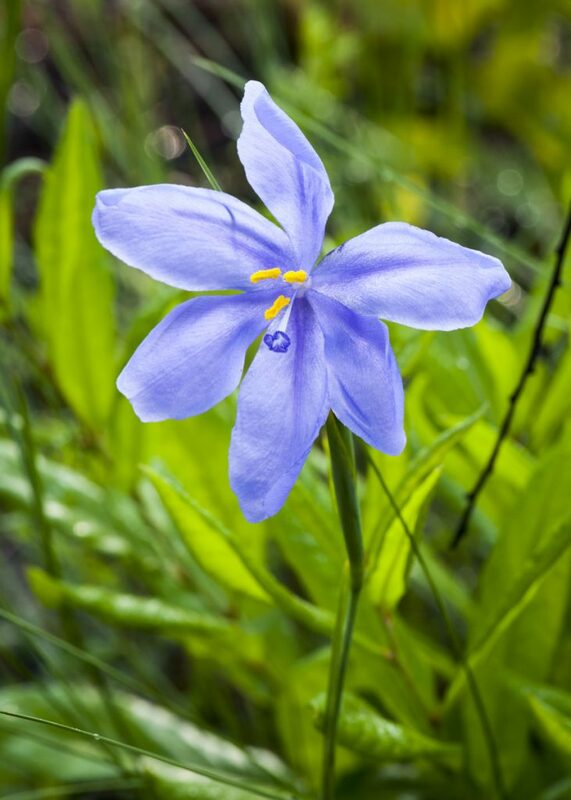 In doing so, the right conditions have been created for the Bartram’s ixia to flourish. Visitors have a small window of opportunity to see the delicate plants in bloom — early in the morning between mid-April and mid-June when individual plants bloom just once and close by mid-morning. Bartram’s ixia (Calydorea coelestina) are protected by Florida law as an endangered species. The plants need prescribed fire every two to three years to regenerate. Found only in north Florida (and mostly on conservation lands), the plant needs wet to mesic flatwoods habitat. This is a perennial herb similar to an iris with slender stems that reaches 8 to 16 inches in height. Violet flowers appear in early morning, but close by mid-morning. Blooming season is mid-April to mid-June. 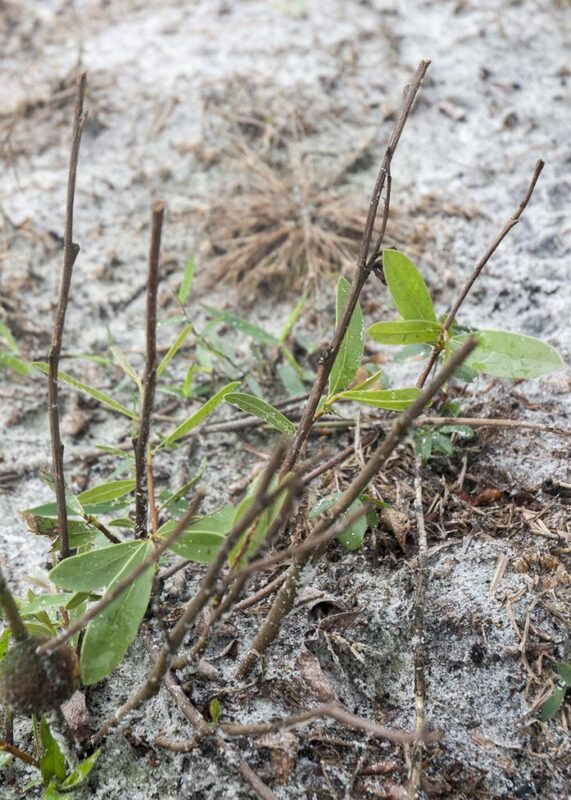 Another rare, endangered plant — Rugel’s false pawpaw — has been successfully transplanted twice at Lake Monroe Conservation Area (Volusia County). In the early 1990s about 15 Rugel’s false pawpaws were moved from a Volusia County road project area that would impact the plants and transplanted along the eastern boundary of the conservation area near State Road 415. In summer 2012, district staff worked with FDOT and contractors to locate suitable habitat to transplant pawpaws as part of an Interstate 4 widening project. Rugel’s false pawpaw (Deeringothamnus rugelii) is an endangered species. Its habitat is open flatwoods and is found only in Volusia County. This plant has a woody base and non-woody shoots that grow 4–8 inches long. Has fragrant flowers and bears yellow-green, peanut-sized fruit. The plant needs prescribed fire every 2–3 years in the growing season to promote flowering and reduce competition. Flowers in late March–June; will re-sprout and flower all year following fire. The species was removed from the federal endangered species list in 2007 and Florida’s threatened species list in 2008, but the bird is still protected under federal and state laws. Florida has 1,340 nesting territories and is home to more nesting pairs than any other state, other than Alaska and Minnesota. 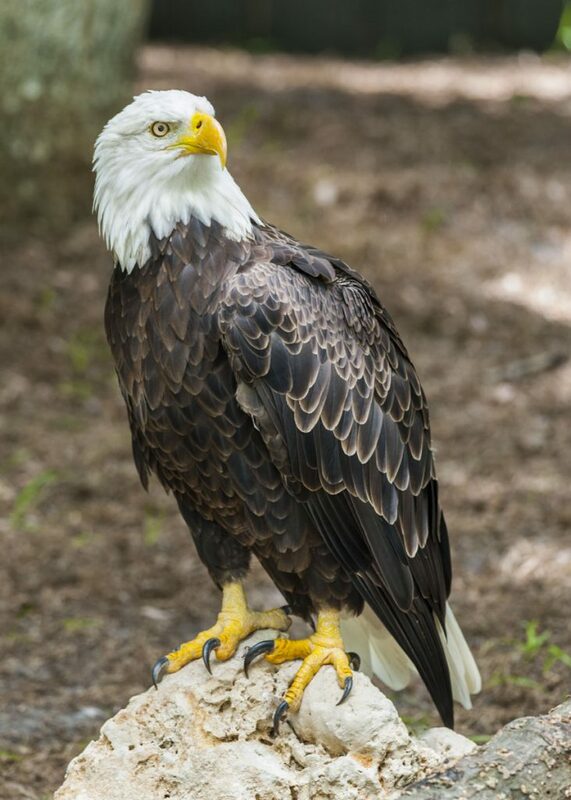 Bald eagles (Haliaeetus leucocephalus) can live about 28 years in the wild. The birds are 34 to 43 inches tall with a wingspan of 6 to 8 feet. They weight 6.5 to 14 lbs. An eagle couple tends to a pair of eggs each year. Young eagles roam great distances. Florida birds have been spotted in Michigan.